Interior finishes create an elegantly warm environment. 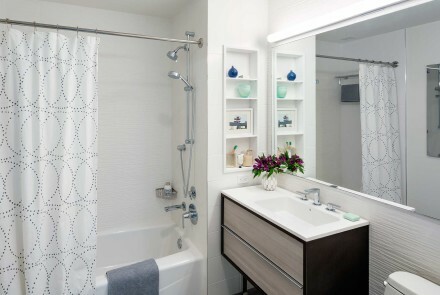 Modern simplicity with integrated, environmentally responsible design. With integrated panelized refrigerators and dishwashers, a white quartz countertop, appliances by Blomberg, Bertazzoni, Bosch and Grohe and Kohler fixtures, the City Tower kitchens exceed all expectations. Custom cabinets are designed with wood insets allowing for an even more elegant cooking and entertaining experience. Under-cabinet lighting provides an ambient glow juxtaposed to picture windows of the city lights. 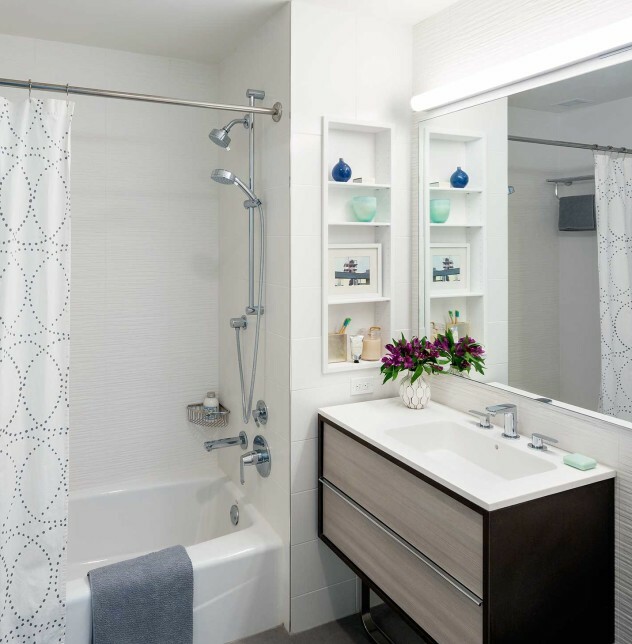 An oversized floating vanity with custom open shelving, mosaic tile feature wall, taupe linen flooring and Grohe and Kohler fixtures complete a serene and beautiful spa-like setting. With open and spacious living rooms, the residences are designed throughout with five-inch-wide oak plank flooring, adding an ultimate grace note to the interiors.